Looking for mobile applications companies in Egypt? The mobile platform has taken the world by a storm and people prefer undertaking all their tasks on a mobile platform. Mobile apps make life simpler for people all over the world and provide services at the touch of a fingertip. Developing a competent mobile platform is vital to your business as it determines how quickly and easily you can reach your valuable customers. With an expertise to deliver turnkey IT related services, we help you partner with your customers quicker and more efficiently by developing custom apps tailored to fit your requirements. We are recognized as one of the best mobile applications companies in Egypt, Dubai, Abu Dhabi, Kuwait, Qatar, as well as KSA. We provide mobile app development services by a team of competent and adept developers, who have been chosen for their dynamism and skills, work with fine details to develop applications that are in the best interest of our clients. 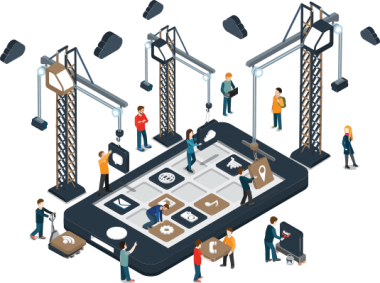 The role played by a web and mobile app development company in helping you grow your business through mobile app development in Dubai, UAE, Qatar, and Abu Dhabi is immense. Mobile applications are being increasingly used by people in the region and more and more businesses are realizing the need for mobile apps to cater to their customers. Mobile applications are making everyday tasks simpler and are thus being applauded by patrons. However, it is important that a mobile app is not developed just for the sake of it. There should be a purpose to the app and it should be made according to the audience that it is set to target. The platform on which it is built should be decided on the basis of its popularity among the target audience. Once the purpose for the app is decided, efforts should be made to ensure it is interesting and simple to use. It should be able to appeal the audience it is intended for. We can help you realize your plans by building apps that best suit your business.